No other attacking player has taken the field for Arsenal as much in that period. 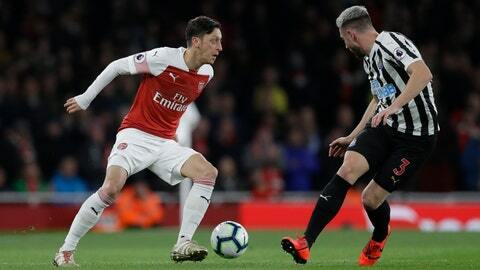 It is Ozil’s longest unbroken run in the team under Unai Emery, the Arsenal manager whose preference for a high-energy approach seemed to conflict with the German playmaker’s natural style. But just as the season has reached its defining stage, Emery is starting to lean heavily on the club’s top money-earner. It didn’t go too well — Arsenal lost 1-0 at Everton on Sunday and Ozil was substituted in the 74th minute after a largely anonymous display — but it was still another signal of the growing harmony between the club’s manager and its most high-profile player. Arsenal heads into the Europa League’s last eight potentially needing to win the competition to secure a return to the Champions League next season. Finishing in the top four of the Premier League would also guarantee that and Arsenal is currently in fifth place, locked in a tight battle with Chelsea, Tottenham and Manchester United to claim the two qualifying spots behind Liverpool and Manchester City. Ozil’s five-match run in the team started in the 3-1 Europa League loss to Rennes in the first leg of the last 16. But Arsenal’s 3-0 victory in the second leg kept alive Emery’s bid to win the competition for the fourth time, after doing so with Sevilla in three straight years from 2014. Napoli, which is second in the Italian league, won the now-defunct UEFA Cup — the precursor to the Europa League — in 1989. It is the club’s only major European honor. Eintracht Frankfurt’s season could hardly be going better under coach Adi Huetter, who replaced Niko Kovac in offseason. The club can match Atletico Madrid’s record for 15 games unbeaten in the Europa League if it avoids defeat in Lisbon.